Seven Spartans enjoyed a six-mile walk in Antrim in beautiful winter sunshine. The walk included Rea’s Wood along the edge of Lough Neagh followed by a section of the Sixmilewater Trail. We spent some time in the newly restored Antrim Castle Grounds before finishing the walk with lunch at the Garden Café, Clotworthy House. Translink having operated on time, a total of 10 walkers (all male, as it happens, the female Spartans must be keeping the economy going) mustered at Helen’s Bay railway station shortly after 11am on Wednesday October 24 for a walk along the Clandeboye Way to the Somme Centre. We set off at a good pace, admiring the autumn tints on the trees and soon we were crossing the main Belfast-Bangor road. It is still amazing that this beautiful walk can carve its way across North Down so far away, for the most part, from roads, traffic and housing. A veritable green artery. A stop was called for lunch just short of the Clandeboye to Craigantlet road, and we found a familiar location. We had used the same well rounded boughs of felled trees for our seats and picnic table last time, when the Wednesday walkers undertook the expedition starting from the Somme Centre. A little bit of sun tried to break through on what was an overcast but beautifully mild and calm day – 13 degrees cannot be bad for the end of October. think that the lead mines provided employment for 400 people in the early 1800s. Indeed, according to Wikipedia, some 13,500 tonnes of lead was extracted between the late 1700s and 1900. Nowadays a haunt for the dreaded scrambler bikes (only at weekends, fortunately), much of the pathway has been cut up but we managed to negotiate the mucky areas with reasonable ease. A quick look down one of the screened over mineshafts, past some of the brick kilns and then it was downhill to the Somme Centre. Mercifully the cafe was open and although some of us were instructed to clean our boots before entering the inner sanctum we were made welcome and enjoyed various types of refreshment. The walk of six miles, or thereabouts, had taken three hours and we were in plenty of time for the 14.35 bus to Bangor station. In view of the contribution they were making to Translink’s coffers, those who were paying fares were permitted to board ahead of the Smartpass holders. The bus arrived at Bangor on time at 14.50 and then it was onto the 14.57 train which delivered us variously back to Helen’s Bay, Belfast and Lisburn. A lovely walk, thanks to everyone for their company – and for preventing the leader from taking any wrong turns! Spartan Spinners trip from Shaw's bridge to Mossley Mill. Antrim to Moira, along the shoreline of Lough Neagh. Once again our chosen means of travel was the 10.40am train from Belfast Central. With four Spartans and one guest in the party, we managed to get all the bikes safely stowed away. Happily it was a Class 4000 train, with double the usual bike storage space. All too soon we were in Antrim. Our route, originally devised by Douglas Ferguson and slightly modified by Ian McDougall, took us through the grounds of Antrim Castle, then along the bank of the Sixmilewater and so to our promised coffee stop at the cafe in Antrim Marina where it was plenty warm and sunny enough to take a table out of doors. Following NCN 94 we went first of all along a lakeside path before heading inland to avoid the busy Antrim to the airport road. 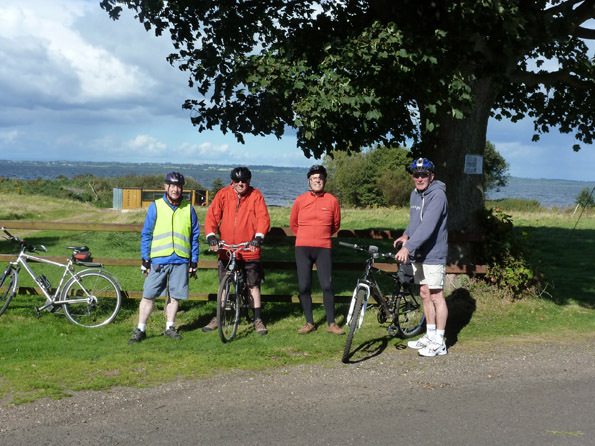 After a bit of a dogleg we re-emerged, crossed the main road and headed back to the shore of Lough Neagh at the Dunore Point pumping station. Then it was down quiet roads in what is a real backwater, the only hazard being a herd of wayward cattle which were being herded with mixed results from one field to the farm. We had to dodge the deposits the cattle had left, in their haste, on the road. That apart, we were treated to tranquil views over the hedges and across the lough to the Sperrins, views best captured from the saddle of a bike. to Crumlin village where Ian knew of a cafe which served a mean Irish Stew for £3.50. Suitably refreshed, we took to the saddle again. The cycle route follows a rather straight section of road before taking a sideroad to the right and soon we were down at the peaceful shoreline again. Note was taken of what passes for heavy industry in these parts - the pyramid of sand at the sand extraction plant by the lough. At the appropriately named Sandy Bay, of course. inland to Aghalee and thence to the Broadwater and Moira station, where we were just in time for the 16.40 train - back into Great Victoria Street at 17.00, where the train was swamped by a flood of weary looking commuters. It was a great day out to a relatively unknown section of the cycle network, and a good 33 mile run. Now that we've had a taster, anyone up for a lap of the lough? Five Spartans boarded the 10.40 train from Belfast Central to Ballymena, and mercifully, plenty of room for the bikes. At Ballymena we detrained and then with Frank Hughes in the lead, took a circuitous route via the banks of the River Braid and the Ecos Centre to the award-winning village of Broughshane, where Frank called a halt for refreshments. We partook of coffee and scones in Jane's Bakery, aka the Reading Room, to fortify us for the challenges ahead. From there it was NCN cycle route 97 along quiet roads and up gentle gradients past tidy fields and then up across moorland before sweeping down to the coast at Glenarm. On a beautifully sunny day, the refreshment room of Glenarm Castle was eschewed in favour of the wooden tables and seats in the recreation area right down on the coastline. A welcome lunch stop, with flasks emptied and sandwiches devoured. Then with the wind on our tail it was a straightforward run back down the coast road on NCN 93 to Larne Harbour, with a mandatory stop at Ballygalley for ice cream. We arrived at Larne Harbour in good time for the 16.30 train back to Belfast, with just over 30 miles on the clock. A great day out and thanks to Frank for organising. Seven of us set off on the 11 am Rambler and were soon walking down and then up the Trassey Road. Plan had been to traverse the col between Bernagh and Meelmore but as the weather wasn't looking great, we diverted to walk across the Ulster Way. We resisted the temptation to have coffee at Meelmore Lodge and continued to the junction with the Meelmore / Loughshannagh path. An early lunch beckoned which we enjoyed hunched behind the stone wall, thereby missing the worst of a nasty shower. when the Rambler returns next year. other Wednesday. Send your offer to lead / follow to Robin asap. Six totally random, unauthorised cyclists met up in Comber and amazingly all six went off in the same direction and seemed to cover the same route (well almost). Despite weather earlier in the week, the sun at least made an attempt to come out now and again and mercifully there was no rain. hoping to miss the cortege. Fortunately we met up with Frank again but at the same time the funeral was heading down the same road towards Carrickmannon. David managed to race the hearse, which lead to philosophically musings as to how we are all “racing the hearse”. The hearse finally caught up with David physically rather than metaphysically, I am glad to report. Ballymoran Bay. Here we stopped for the obligatory shot of all the cycles and cyclists courtesy of Pat’s camera. Hunger sped us on to Whiterock and lunch at Daft Eddy’s on Sketrick Island. There we met up with the ladies, who very patiently had waited for us. After lunch we were all keen to go on to Nendrum but when it came to the turn off enthusiasm waned. The lure of Castle Espie Wildfowl Coffee shop was too much. The size of Doug’s lemon meringue pie was impressive and we were even more impressed when Doug managed to eat it all. It was then a short run back into Comber and through the town to where the cars were parked. In the absence of high powered technology, I was unable to work out the distance, elevation and speeds for you all. However my low tech piece of string reckoning measured the total distance as 27 miles. So much for midsummer sunshine! The heavens opened as I drove towards Slemish and the Wednesday evening walk. It had been wet for longer in Belfast and only 2 others had made the journey up. We looked round the exhibition in the visitor center until the rain slackened then talked ourselves into setting out, sheltering under David's golf umbrella at times.Nonetheless the rain lifted and we made it to the summit dry and with views. We could see the clouds gathering and scurried back to base, completing the circuit within 90 mins - a good 5 min before the monsoon started again. Slemish is a nice little peak, quite steep but with good access (one of the long distance walking paths goes nearby which could be included in a day walk in the future). Carrie had 7 others meet her on the edge of Downpatrick for the walk in Castleward. We enjoyed a rare evening of sunshine - it is June after all. The National Trust have opened some new trails through the grounds there and we took these through fields of cattle and woods and foxgloves and passed Castleward house with it's two worlds of Classical and Gothic and along avenues and paths that took us back to our transport. A great walk in very pleasant surroundings. 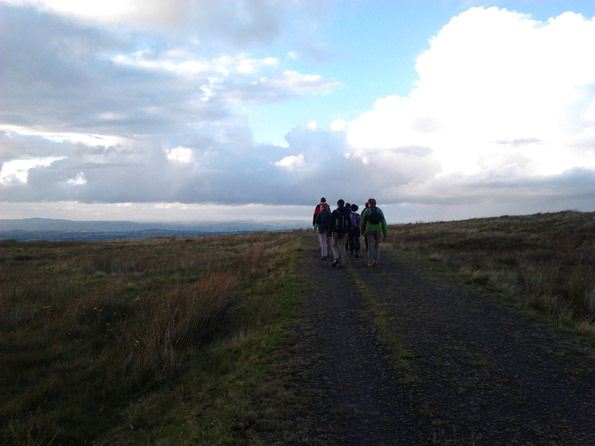 On this last Wednesday Morning Walk before a summer break, we enjoyed a new way-marked route and pathway around Black Mountain with excellent views over Belfast, Strangford Lough, Lough Neagh and the Mourne Mountains. There were wild flowers in abundance including the purple heads of orchids and Ragged Robin – identified by Mary. The weather stayed dry and fine as we enjoyed our picnic lunch with views from Divis Mountain over Belfast Lough. Six Spartans emerged from the subterranean passage of Carrickfergus Station to a sky of blue with threatening clouds, sporting a variety of clothing choices ranging from waterproof coats to tee-shirt and shorts. The optimists certainly won the bet with, blue skies being enjoyed overhead for the entire day, apart from the very last mile approaching Carrickfergus. The 31mile route started through the suburbia of Carrick, climbing up to Dalways Bawn Road towards Ballycarry, where a stop was taken to enjoy the views over Islandmagee and beyond towards the Copeland Islands and Scotland. 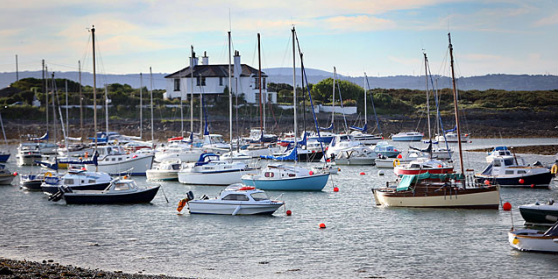 After a fast descent to cross the causeway at the tip of Larne Lough, a vote was taken with the choice to either go clockwise and have a late lunch or to go anti-clockwise and enjoy both an early lunch and an afternoon tea-break in Whitehead. Not so tough a choice as, Wednesday outings are of course renowned for the quality and quantity of refreshments breaks, to the outcry of Saturday Only Spartans! was another steep climb up from Ballylumford Power Station and then down again to Millbay, but up yet again with hairpin bends to reach the surely inappropriately named Low Road, which was then followed towards Whitehead. Road. A short section of the busy A2 was necessary as a far as Eden where the clouds appeared, then navigating back to the station via the new housing developments to the east Carrickfergus. The walk on Wednesday evening was a little bit different from the usual Spartans walk in that for a mile of our ramblings we were below ground. Ed had organised a great outing where we met outside Rices' hotel in Poyntzpass and drove to the southern end of the Lissummon Railway Tunnel - a remnant of the old Newry to Armagh line which closed completely in the 1950s. Helen regaled us all with the history of the Newry/Armagh line and the reason for the tunnel's existence. The tunnel is the longest Railway tunnel in Ireland at 1759 yards and on approaching the entrance we could see a little dot of light which assured of our way out. We all noted how good the workmanship still seemed to be as we made our way through. There is a little water seepage and little small fine stalagtites hanging from the ceiling but it is not that difficult to imagine a fine old steam train making it's way through the darkness in a cacophony of steam and steel. From our exit on the northern end of the tunnel, Ed led us through fields and farmyards and over fences until we finally made it to the lofty environs of Lissummon Forth - the remnant of an Early Irish Hillfort that gave us fine views over the hills of South Armagh and the Cooley Penninsula and all along south County Down from the Mournes and over to Slieve Croob with Dromantine and Drumbanagher Demenses in our near vision. A few field lengths further from the Hillfort and we were back at our cars and still a little daylight left to see us back to Poyntzpass. 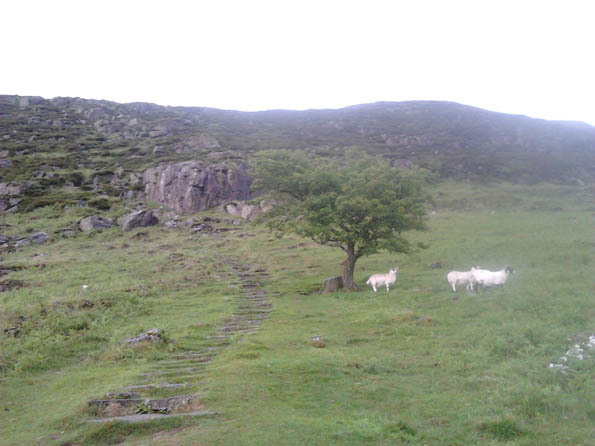 An interesting and unusual walk in fine scenery and through layers of Irish history. Thank you to Ed and Helen. 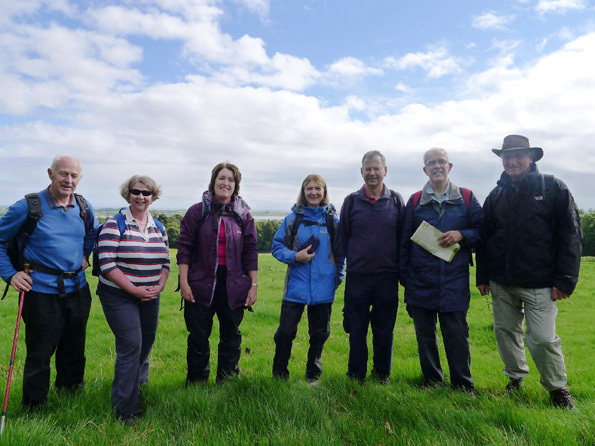 A group of 11 Spartans walked part of the Lecale Way from Ballyhornan to Ardglass today. Leaving the car park in Ballyhornan we followed the coastal pathway around several headlands with views to Gunn Island and the Mournes. Many wild flowers were in bloom especially sea thrift. Passing St Patrick’s Well we headed inland and continued along a quiet country road to reach the ruins of Ardtole Church. We continued to Ardglass and enjoyed a pleasant lunch at the Tidewater Cafe. Barra Best had warned us to take our umbrellas but actually the weather was beautiful and it was the sun cream we needed! On what must be one of the most glorious Wednesdays of this (or any) year, 10 Spartans convened at the Rinka on Islandmagee - our mission: to tackle the coast near the from the Gobbins south. So keen were we that not only did we skip the home-mad ice-cream, we left promptly at 7 and were hiking by 7:05. We explored the dramatic cliffside Gobbins path until it fell into the ocean before us, then reversed and strolled merrily on towards Cloughfin Bay. There were a few scrambles (and one slip) on wet rock but otherwise a relaxing evening out, We were in the shade but the evening was so mild and warm that we were still comfortable. We stopped to skim stones over the still bay, getting back to Ballystrudder 2 and a half hours after the start. Gerard. A total of 8 took part in the second ride of the year from Newry station to Portadown station in perfect weather. Joining the Newry Canal via a new cycle path under the Craigmore Viaduct was appreciated by all but the tallest rider! A fast section was enjoyed along the canal until Poynzpass which signalled the first diversion in search of the legendary Lissummon Railway Tunnel. A one yard less than a mile and at a gradient of 1:75 it is the longest in Ireland. Our route took us up a steep ascent over the top of the tunnel with the evidence of both ends in undergrowth in the fields beneath. An exploration of the tunnel is eagerly awaited and in hope of this due homage was paid at the Whiteside homestead. After the considerable climb and fast descent to Poyntzpass, a leisurely lunch was enjoyed in Rice’s Hotel whilst the mercury rose outside. Three Spartans started out from the Upper Square at Castlewellan and headed into the Forest Park. What we lacked in numbers was more than compensated for by the quality of my walking companions – Pat O’Neill and Anne Lockwood. We walked the Slievnaslaat trail which goes up hill and down dale through mostly mature coniferous forest. At times the forest trail, lined on both sides with tall trees stretching skyward, assumed the appearance of a grand outdoor cathedral. The bluebells were abundant on all sides and a continuous soundtrack was provided by different varieties of birds. Along the way we visited the remnants of the Moorish Tower – a 19th Century folly built by the Annesley family with a commanding view of the Isle of Man. Through openings in the forest we were treated to impressive vistas of the farmland on and around Slievenaboley, Legananny Mountains and Slieve Croob. On completion of the trail walk, we visited the Annesley Garden and Arboretum and were collectively ‘wowed’ by the magnificent collection of trees and shrubs set in beautifully landscaped surroundings containing ornamental fountains and ponds.Anne, who impressed with her knowledge of many of the exotic plants, called this hidden gem Northern Ireland’s answer to Kew Gardens. After the walk we exited the Forest Park, passing Castlewellan Castle, and proceeding to Bilbo’s Bistro where the very friendly staff served us a delightful lunch with multiple coffee top-ups. The consensus rating was 9 out of 10 on the basis of friendliness, quality and value for money. This being the exam season, let me start this report with a sneak preview of a question from the Northern Ireland A Level mathematics paper, 2012. If one Spartan Red Sox walker boards the train at Lisburn, one at Great Victoria Street, two at Central, three at Helen's Bay, then two more join the group at Bangor station, while three more people, only two of whom are walking, are waiting at the Somme Centre cafe, how many took part in the Wednesday walk? Answer, I think, 11. On a cloudy but spring-like morning our challenge was to complete the eight-mile walk from the Somme Centre at Conlig to Helen's Bay railway station. But first, in order to aid recovery from the rigours of the train and bus journey, we relaxed over a cup of coffee in the cafe at the Somme Centre. A place one must come back to to visit at some future stage. Maps of the route, downloaded from the Walk NI website, were distributed (Alan Rooney style) to the walkers and we strode off shortly after 11am up to the Lead Mines, which provided employment for 400 people during the heyday in the mid 19th century. Picking our way past the brightly coloured gorse bushes and across the muddy tracks left by the scrambler bikes, we paused to admire the view over to Scrabo Tower before heading for Helen's Tower. We were glad to leave the bike tracks behind and to cross a wall into more easily negotiated woodland. Bird song aplenty and fresh bright foliage on the trees. Mercifully, the strong north wind of the past few days had abated, and it turned out to be a beautifully calm day. We paused to regroup at Helen's Tower, now used as a holiday let but rather sadly,fenced off. The tower, celebrated in poetry by Alfred Lord Tennyson among others was familiar to the men of the 36th Ulster Division who trained in the woodland before heading off to the Somme. A replica tower has now been built at Thiepval, to provide a link between the Somme and Northern Ireland. We took a gradual descent along the gravelly roadway down from the tower, meeting a few dog walkers on our way. Passing ponds on either side of the walkway we noted a swan on the nest, and then a greylag goose. Emerging onto the Clandeboye to Newtownards Road and had to walk a couple of hundred yards along the side of the road to reach the next section of the Clandeboye Way. A rather hazardous exercise, with fast moving traffic. Wonder why the authorities cannot put a pavement in or at least warn motorists that walkers might be at the roadside. Another observation: although this is a lovely walk, easily accessible, there is minimal evidence of any waymarking. Surely more could be done to encourage greater use of this facility, by waymarking and providing information on distances. These and other matters were discussed during our lunch stop, with a couple of conveniently felled tree trunks providing ample seating for our group. In such rural surroundings it was hard to believe we were so near to Belfast. Our two new recruits, Denis from north Belfast and Avril from Magheralin, were able to reflect on their first day out with the Red Sox. We hope they will be back! Then it was back to the Clandeboye Way, heading through pretty woodland along this green artery. The bluebells and primroses were still full of colour, and we paused to examine the wild garlic, what an evocative odour! Along the way, Ian McDougall inculcated more people into the rather extreme hobby of geo-caching. He successfully located a geo-cache nestling in a fence post, so we all gathered round to examine the contents. It remains to be seen if there are any converts! We were now on Clandeboye Avenue, the carriage route from Clandeboye Estate to Helen's Bay, and the path became broader and flatter. Successfully traversing the main Bangor to Belfast dual carriageway at Ballygilbert, we were glad to re-immerse ourselves in the woodland, away from the traffic and the fumes. After we went underneath the Crawfordsburn Road it was time for Gordon Davis to lead us around part of Jack Lindsay's newly created path around the saplings. The full route was due to be officially opened on the Wednesday evening walk, so this was just a sampler, but very impressive it was too. Back on the main drag we headed for Helen's Bay station, our pace stiffening as we checked the train timetable. The walk finished somewhat abruptly with some opting for the 14.32 to Bangor, and some for the 14.36 to Belfast. We had arrived ahead of schedule, and had enjoyed a dry and delightful walk along, as the late David Watson put it, one of the undiscovered gems of Ulster walking. 11 members and 2 dogs enjoyed lovely weather as we walked down Lagan Meadows and across the bridge at the bottom of the Meadows. We then wended our way through Belvoir forest and enjoyed a nice open air lunch break at the newly re-opened Lockkeeper's Inn before heading back down the Tow Path and up Lagan Meadows to the cars. 10 of us met at Spafield car park on Holywood High Street on a chilly morning, with a strengthening wind but thankfully dry-the Met office had promised it would remain dry in the East until the afternoon,and so it proved (so they are right sometimes). We set off down Belfast Rd and up Jackson's Rd into the Park where we picked up a couple more making us the round dozen. repaired to the Coffee Yard for a pleasant lunch - although those with the plum coloured soup may beg to differ with that assessment. Worth 3 sox at least, possibly a 4. 11 of us assembled at Groomsport to walk along the coast to Orlock and beyond.It was dry but rain was forecast later. The first part along the coast was with pleasant varied views. When we reached Orlock the coast became undulating and somewhat more muddy, but it was great training for what was to come. On arriving at the Donaghadee road we crossed over to walk round Portavoe reservoir with its attractive ducks. Unfortunately the path became extremely muddy,but there was no thought of turning back and we used every ingenuity to avoid the worse by diverting to left and right through brambles and trees finally completing the circumnavigation of the reservoir. which was again satisfied ith excellent Strudel Bistro. We all felt it retained its catering status of 4 redsox. We enjoyed a good walk from Carnalea railway station to Holywood by the N Down Coastal path, in good weather but walking into a stiff breeze in the latter stage. We had a quick coffee in Crawfordsburn C park café after 1.5 miles: this almost put the following sub-group off the scent, but eventually David and Gordon found us. Then it was into the Dirty Duck for chowder. The good news is that at least another three walks are lined up at fortnightly intervals, so all welcome, usually 6-8 non-strenuous miles, ideally with refreshment at end (and sometimes at start too).